One of the most powerful pepper sprays available. Stream disperses up to 12 feet! Protect yourself or a loved one with “The Club” Pepper Spray, an easy to use personal protection device containing one of the most potent pepper formulas available today. The Club Pepper Spray uses Oleoresin Capsicum (OC), a resin extracted from hot peppers that is available in many strengths. A Scoville Heat Unit (SHU) rates the potency and heat of the OC. 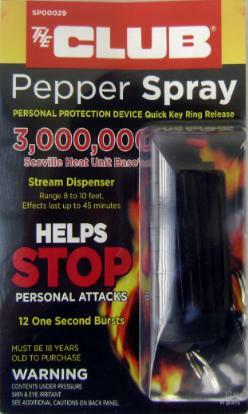 Most pepper sprays have a 1MM or 1.5MM SHU rating, The Club Pepper Spray features an over 3,000,000 Scoville Heat Unit formula. The stream is effective up to 12 feet in a concentrated area, reducing the risk of contamination to persons outside the intended strike area. Unlike a fog or foam formula, only the attacker is enveloped in the stream. Upon The Club Pepper Spray’s contact with the mucous membranes (eyes, nose, throat, and lungs), the capillaries of the eyes dilate, causing temporary blindness. Breathing tissues become inflamed, causing choking, coughing, nausea and extreme discomfort, disabling your attacker for up to 30-45 minutes, including those under the influence of drugs and alcohol. Note: Not for sale to minors or where prohibited by state law. (New York, Massachusettes, Michigan and Wisconsin) Possession of this device by anyone under the age of 18 or by anyone who has been convicted of a felony or assault is illegal. Use of this device for any purpose other than self defense is a crime under the law.